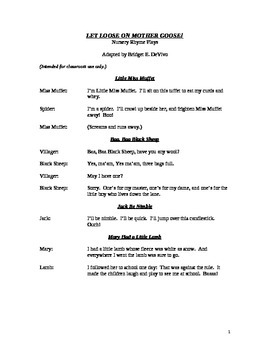 This is a Readers Theatre Script that includes some of Mother Goose's most popular rhymes. It is suitable for reading levels 1st and up. However, it can be used with Pre-K and K. Students in Pre-K and K can easily take on the roles of the characters and repeat the lines after you! I also include helpful tips, websites and prop and costume suggestions at the end of the script.